A call option is considered to be in the money if its strike price is below the current price of the underlying asset. A put option is considered to be in the money if its strike price is above the current price of the underlying asset. Regardless of whether an option is a call or a put, when an option is in the money, is has intrinsic value. Put simply, in the money means that an option is inherently worth something. Whether the option can be exercised or not prior to expiration depends on if the option is American style or European style. All stock options in the US are American style and can be exercised anytime they are in the money. Most options on stock indices are European style and can only be exercised if they are in the money at expiration. Note: In the money will sometimes also appear as “in-the-money” and “ITM.” Both variances of the term mean the same thing. However, “in-the-money” is most commonly used to describe an option, i.e. the in-the-money put. Whereas, “in the money” is most commonly used to describe where an option is located, i.e. it is located in the money. AT&T’s stock, which trades under the ticker T, is currently trading at $38.03 per share. Every call option with a strike price of less than $38.00 is considered in the money. Every put option with a strike price more than $38.00 is considered in the money. 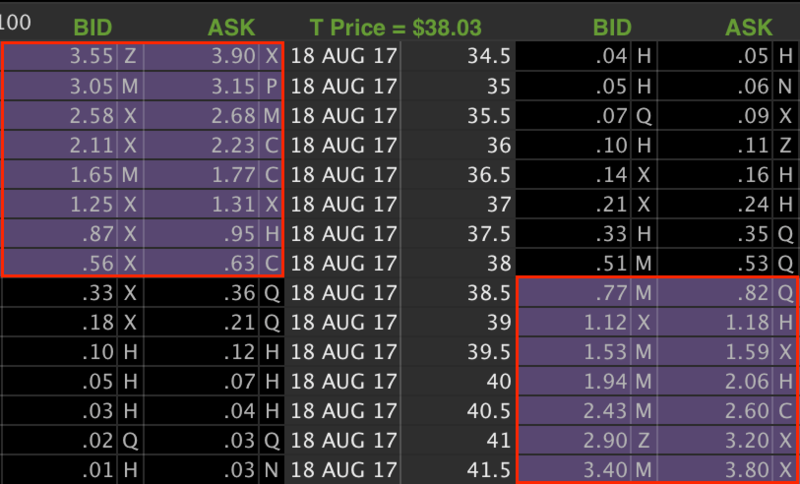 This option chain shows the in the money options with the calls on the left and the puts on the right. When a call or put option is in the money, it has something known as intrinsic value. This is the most important thing to know about ITM options. This means that the option contract is actually worth something. Intrinsic value for in the money options is fairly easy to calculate. Out of the money options and at the money options have zero intrinsic value. Because calls give traders the right, but not the obligation, to buy the underlying asset at the call’s strike price, the intrinsic value always equates to the current price of the underlying asset minus the call strike price. In the AT&T stock example trading at $38.03, the intrinsic value of the $37 call option is $1.07 (which is $107.00 because 1 option contract = 100 shares of stock). Just like when a call is ITM, when a put is in the money it has intrinsic value as well. In the AT&T stock example trading at $38.03, the intrinsic value of the $39 is $0.93 (which is $93.00 because 1 option contract = 100 shares of stock). Understanding in-the-money options is absolutely critical for successful options trading. It is important to distinguish that just because a call or put option is in the money does not mean it will be profitable at expiration, but it does mean that the option currently holds intrinsic value. The probability of being profitable at expiration is increased because the option has intrinsic value, but it is by no means a guarantee. – Every ITM stock option can theoretically be exercised at any moment. – If an ITM call were exercised, 100 shares of the underlying stock for every 1 call would be purchased at the call strike price. – If an ITM put were exercised, 100 shares of the underlying stock for every 1 put would be sold short at the put strike price. – Exercise can only occur for options that are in the money. – Options that are out of the money can wind up in the money, and vice versa, due to changes in the underlying asset’s price.